June 18th & 19th, when the San Francisco Bay Area and the California coast from Mendocino to Monterrey are windy, cold, and often dreary with fog, Isleton California in the Delta is sunny and warm. This is the time of the year when the Cajun Festival (Formerly Crawdad Festival) is back from a year off. Bikes, Boats, and RVs converge on the tiny historic town to eat Cajun style boiled crawdads,alligator on a stick, listen to music, and shop for boutique gifts and antiques. The entry fees are low and the town has tried to orient the program and rules toward the entire family, there are other island retreats in the Delta region where there are other RV hook-ups at reasonable overnight rate. In 2009 Iselton City officials announced that their World Famous "Crawdad Festival" was cancelled. Economic hard times and some politics were cited for the decision. 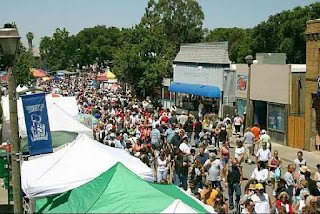 Fans of the Festival later learned that Isleton also sold the Festival name and rights to a Red Bluff California Group who now operate a Festival under that banner. However, Isleton has settled all issues and have a united front to make The Cajun Festival bigger and better. Now, I was raised here in the Sacramento Delta myself, and as a young boy my brother and I would venture through Freeport, Clarksburg, Steamboat Slough and wherever our Schwinn bicycles could take us. Fishing and hunting, trapping Crawdads and gigging Frogs. Exploring and sometimes getting in trouble raiding sugar beets, and pear orchards. Though we did have virtues helping the Delta farmers keep down the jack-rabbit population with our .22 rifles and sometimes, bow and arrows. We were real "Huckleberry Finns and Tom Sawyers!" It could have been due to my being an avid Mark Twain fan, or just 'genetics' from my Louisianan heritage where my Great Grandfather lived and "shrimped" for a living out of Shreveport. Just because Red Bluff is on the Sacramento River does not a "Crawdad Festival" make! I know for a fact if any crawdads are found up north there, they are few, and not... "Delta!" For example you can use ingredients from Italian Food recipes...but it's Italian "Style" not Italian. Those Northerners just ain't got "Delta" like we do here. Later in life I was part owner and General Manager of Steamboat Slough Resort. Taking that opportunity to use our watercraft rentals to finally explore more of the 1,000 miles of Delta Waterways, I was forever bonded with the "magical wonder" one experiences because of the 'sense' that this "living organic Eco-System" we call 'Delta'... gets in your blood. It's a "river rat" thing, and anyone can partake of it's authenticity and flavor, when they come and explore The Delta. Isleton is the embodiment of that "magical wonder" that transports you to another time and place where at any moment you sense you just might see Samuel Clemens sitting on the porch of the local Newspaper Office, as the sounds of a passing River Boat's steam engine chugging away to parts unknown... embedding all the sights and sounds and senses into your memories of that long ago era. Don't worry about the better things that city life offers, the Deli at 25 main street offers Gunther's Ice Cream for you Sacramentans and Genova Bakery goods for the Stocktonians. Antique Shops and Art & Eclectic Curio shops alike will offer great gifts and photo memories and video chronicles for your Delta adventure. Bob's Bait Shop is there for the real 'Huckleberry' who can walk over the road to the Sacramento River where the life flow of this Delta comes from, drop a line in and get their "fish fry" as fresh as it comes. No Comment to " Isleton "Cajun Festival" ( Shhhh...it's really the Crawdad Festival! ) "